As of 3/28/04 Apache received his ISWS CHAMPIONSHIP and is the second dog ever to acheive an ISWS Championship. 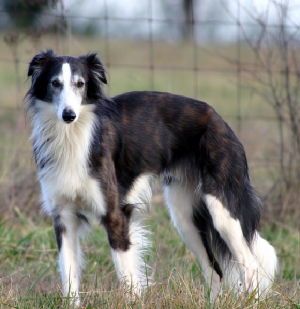 As of July 2005 Aapche is the second silken ever to achieve a RARITIES "GRAND" CHAMPION title. ever ISWS GRAND Champion Silken! achieved the title of NAKC SUPREME GRAND CHAMPION ! Apache caught our eye as soon as we saw him at the 2002 Silkenfest in New Jersey. His eyecatching color and along with his abundance of high spirits made us fall in love. When we saw what wonderful conformation and movement he possesses, we knew we had found our first breeding male. The judges also concured and gave him first in his puppy class. Since then he has proved his ability winning Best in Shows at multiple shows. He has numerous titles at this point. See his stats page. He has surpassed everything we had dreamed of. 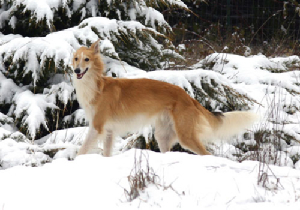 His conformation along with looks, personality, health, and color makes him a prime example of a beautiful Silken Windhound. We thank Judy Henderson for this lovely boy.